Goin’ back to Cali, to Cali… | the wine snob. First of all, a big THANKS to Seth Long of Seler d’or Wine Consulting/Blog-writin’ for including me as a guest blogger in his “29 Days of Chardonnay” collaborative effort! There were some truly inspired posts about the wondrous little grape known as Chardonnay, and I’m glad to have been a part. For anyone that didn’t read my post, check it out! I was a little intimidated by all the mad knowledge being dropped by some serious heavy-hitters in the Wine World, so I went with a pretty jovial and interactive post, and I was pretty happy with how it came out. So by all means, read it! In honor of the 29 Days of Chardonnay, I wanted to share an awesome Chard we poured recently, and still have in stock. We also got in a brand new Petite Sirah that I just HAVE to share. So this has turned into a post about California. Good old Cali! 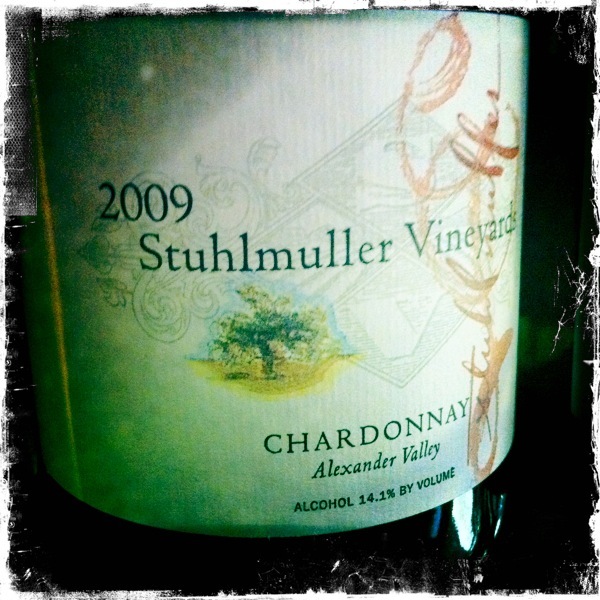 So let us begin with the Stuhlmuller Vineyards Chardonnay, 2009 Alexander Valley. This is by far one of my favorite California Chards I’ve had in a loooog while. A beautiful bright lemony color, it literally be glimmerin’ and shinin’ in the glass. Incredibly clear and clean, just looking at it pretty much makes you want to drink it. Pretty, warm aromas of meyer lemon and other fun fruits like figs, pineapple, kiwi and minerally hints are just gorgeous. Flavors of green apple, citrus and lemon blossom are beautifully and expressively layered. Are you an “oakaphobe?” Try this!! It’s made with just French oak, only 8% of which was new (the newer the oak, the more of its oakiness it imparts). Normal retail on this guy is $22. But if you’re reading this, and you come pick up a bottle (or two or four… til’ they’re gone) at Cellar THIS WEEK ONLY- you can have it for $19. You just have to tell us you read this! Wine Enthusiast gave it 91 points and Robert Parker gave it 89! I actually didn’t know that until I sat down to write this. Props! Next up is the Ballentine “Fig Tree Vineyard” Petite Sirah, 2008 St. Helena. A bit of background on how I came about this wine; from time to time, I have to suffer through different wine companies Portfolio Shows. I believe I’ve mentioned these before. So basically there’s a big room, or several rooms, full of open bottles of wine in allllll price ranges, and I have to go through and taste them. It’s really the absolute worst part of my job. I mean, open wine and a room full of wine people? Terrible. So I came upon this wine at the very end of a long afternoon of wine tasting, and was completely struck by how good it was AND how reasonable it was in price. This after tasting some serious heavy-hitters. Also, a ton of our regulars adore Petite Sirah- so I was stoked to find a new one to share. True to form, this wine was a favorite at it’s first wine sale appearance two weeks ago, and its currently a by-the-glass pour as well! So you can come taste it any old time you want. But beware- it’s only 1050 cases produced, so that means it very well could go bye-bye at some point, if we keep selling it at this rate! Speaking of 1050 cases produced, that is another crucial point- a small-production California wine for this price is pretty unheard of (we’re selling it retail for $20!). Now lets move on to how it tastes! A whopper of a palate- big notes of boysenberries, blackberry liqueur, blueberries, a tight core of spice and purple-teeth-inducing density. It’ll be worth having purple teeth to drink this guy up. Meaty and manly, yet with soft edges, remarkable smoothness, and no flabbiness. Nice hints of black pepper, sage, vanilla and caramel. A truly delicious bottle of wine. A dream come true for your next rainy day beef stew, roasted lamb or big ‘ol steak. Enjoy this now while we still have these chilly nights! Hope you enjoyed this Cali post, I’m gonna wrap it up for today. I’m jetting off to Vegas on Thursday, so if you follow me on twitter, be prepared to hear about all the ridiculous wine I’ll be drinkin’! ← Dear Yelp: you are the worst. Here’s why. 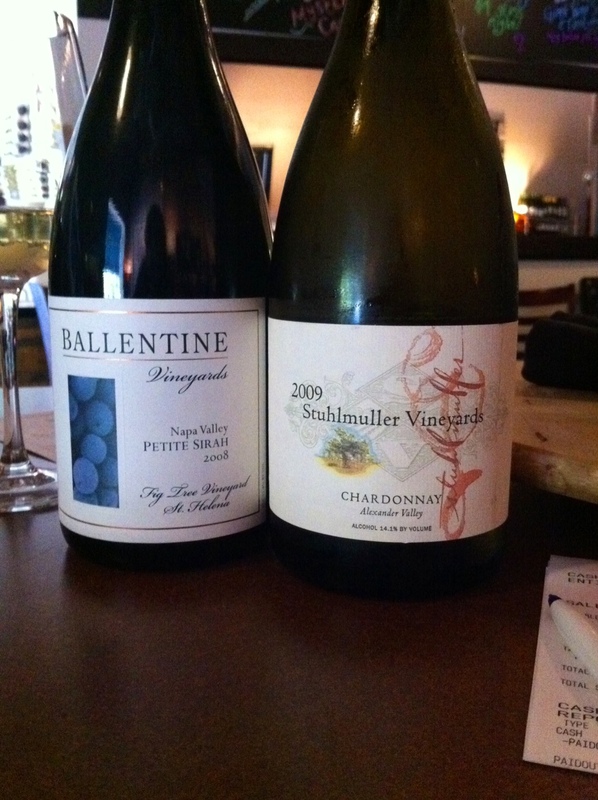 The 2008 Ballentine Vineyards “Fig Tree Vineyard” Petite Sirah is as incredible as stated above. I’ve been raving about it to my wine drinking friends and urging them to get to Cellar on Greene to get some. I bought three bottles at the wine tasting. After enjoying a bottle over the weekend and realizing I only have two bottles of this gem left, I wish that I had purchased at least six. The best red for the bucks that I’ve had in years! Glad you like it Jeremy! You’re not alone! Thank you for participating! You rock!